With the major operator's Summer programmes out, it looks like a rather lean season for the traditional enthusiast railtour. Aside from the open days and galas which seem to be springing up, it's going to be a case of making your own entertainment it seems. So today, despite a nagging toothache which necessitated serious medication, I dusted off my plan to cover as much light rail track as possible during the year, and headed for Nottingham. As ever, took a roundabout route travelling first up to London. A nice, quiet ride up on the direct train from Highbridge, too early to be bothered by FA Cup Final crowds. The Circle Line was predictably sluggish in getting us to St Pancras International, and this meant only time for a cursory glance at the station. This was my first departure from the refurbished shed, and as on my first walking visit a couple of months ago, it didn't fail to impress. Found the statue of Sir John Betjeman too, staring in awe at the roof right at the front of the concourse where the entrance used to be. Onto a busy Meridian unit for Nottingham. Managed to get an excellent fare for this, possibly due to passengers flagging this for the next, faster service. No particular concern for us, as we sped along the Midland Mainline, now under the auspices of East Midlands Trains. A timely, easy run. Recalled at Bedford that I'd been here before with a serious toothache, and that I was heading for Nottingham that time too. Arrived at a fairly busy Nottingham station and headed for the NET platforms at Station Street. The plan was to cover the network in a few moves, and then seek refreshment. Surprised at first by the clean and tidy look of the stops and the trams. First onto a Hucknall tram, winding through the city centre and needing to readjust my bearings as we encountered familiar places from different angles! Impressive but sad to see the viaduct crumbling away at Weekday Cross, signalling a bygone age of railway. The tram pressed on into the suburbs, curving sharply to descend alongside the Robin Hood line to Mansfield and Worksop. We gathered speed here and soon arrived at the shared tram/rail station at Hucknall. A swift change of ends in order to double back to David Lane, a rather quiet stop with nothing nearby. However, this enabled us to take the next branch train to Phoenix Park using the alignment of a former freight-only branch to access the Park and Ride stop. Another change of ends, and a chance to note the surprising gradients on the branch as we headed back towards the city. Also figured that as there were two trams in the depot, we'd managed to see the entire fleet in our brief visit! Hopped off at Old Market Square, an early memory of Nottigham for me, and headed away from the shoppers and towards the castle. My target was of course Ye Olde Trip to Jerusalem. An absolutely must-visit pub didn't disappoint with it's signature beer still very good despite a change of brewery. Then a wander back to the station, with a chance to watch a freight pass and have a bite to eat before heading back to Derby. Lots of interesting things lurking at the RTC, including the not-yet-ready for traffic 56311 belonging to Fastline. Interesting to hear a couple of passengers beside us heading from Bristol conversing about Highbridge pubs, and indeed my local on the journey back! Despite the toothache, a good day out with plenty of interest. 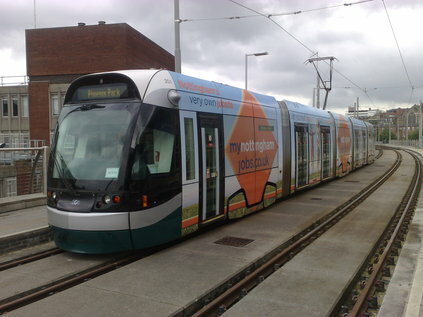 I remain really impressed with the tram system in Nottingham, and it will be interesting to see it develop and grow.